The patio of the new Dairy Queen in Sunbury. 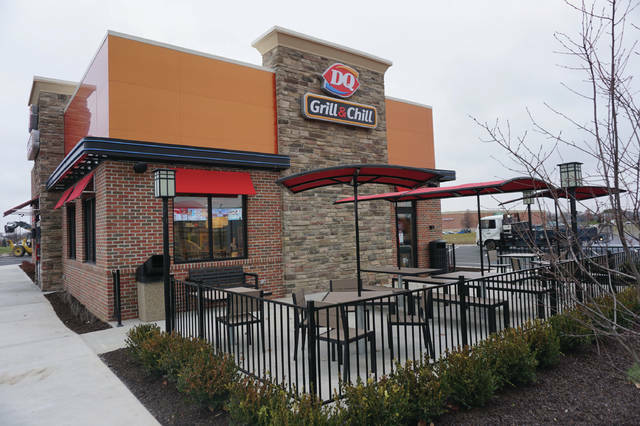 The new Dairy Queen in Sunbury, whose products include soft-serve cones and cups, had what corporate types like to call a “soft opening” on Monday. A fancy grand opening for the Grill & Chill at 211 West Cherry Street in the Sunbury Mills Plaza is slated for after the first of the year. In a way it already is, because serving Blizzards and such represents a first job for about half of the new store’s 60 to 70 employees, who attend Big Walnut High School, including members of the football team. In addition, the store will offer fundraising opportunities. 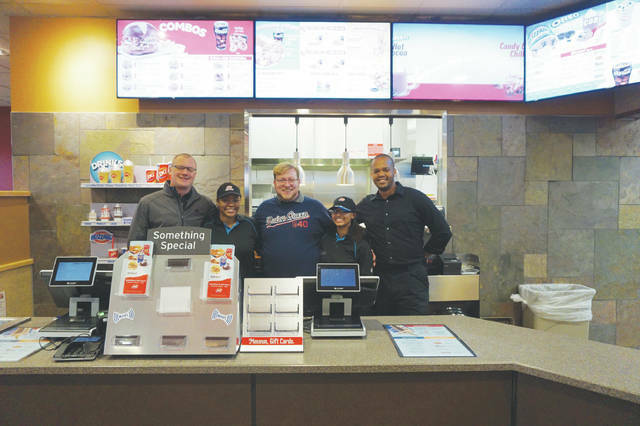 “I like to see smiles on faces and create a fun atmosphere,” said employee Marcus Jacobs, who was moving to the new store after a few years in the New Albany DQ. Scott Kleinman is franchisee for both New Albany and Sunbury DQs. “My business partner Dr. Rick Weiner and I, we look at Dairy Queen as part of a community,” Kleinman said. “We look for communities we can actively get involved in. We like working with the young people for their first job. They get to learn a lot of things — teamwork, communication, problem-solving. We like to be that place in the community where people meet before and after events. Kleinman said he likes the store’s location in the Plaza. “I live in the Detroit area, and have now been to the Sunbury area a number of times,” said Mike Mettler, International Dairy Queen Inc. Vice President of Franchise Sales and Development. “I was amazed by the growth, I think two thousand people in the last few years, but also a great community, the high school and good employment. When we look in an area before approving a new location, we want to make sure there’s enough families and activities, daytime employment in terms of lunch trade. “It’s in front of a Kroger,” Mettler continued. “I’ve sat in that parking lot and remember seeing a lot of traffic. I also work with a number of Ohio State fans, and they travel through Sunbury on the way to Columbus. It’s a small but growing community with a lot of good things going for it — an older downtown and a new retail area, good employment, and convenient to the highways.